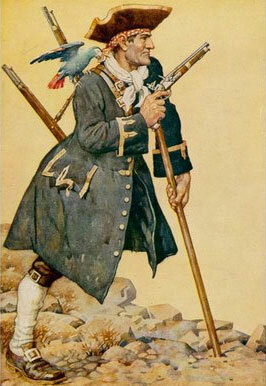 - The wooden leg was best to replace an amputated limb lost in battle and allowed the pirate to keep his dignity and be helpful on board where every man was needed to work in his role. The pirate could use his wooden leg to hide tools for his escape if he was taken prisoner! - The golden earring gave the pirate protective properties than other materials did not. Gold cures vision and prevents diseases of the eye. - The parrot: pirates marveled at its colorful plumage and ability to imitate the human voice. It was the pirates’ good companion that would break the monotony of long journeys. - The metal hook replacing the missing hand was privileged to an articulated hand because it was more useful for climbing and lifting bales of merchandise .... and during a collision could be a formidable weapon.